If you have been impacted by the recent DePuy ASR Hip Recall, Finn Financial Group is here to help. For over 20 years, Dan Finn has personally helped thousands of people achieve financial stability after a life-altering experience through what is known as a structured settlement. A structured settlement is a unique option available exclusively to those anticipating a settlement from a personal injury claim. It provides unequaled financial security to personal injury victims and their families…guaranteeing financial peace of mind. Using a customized payment plan guaranteed by a highly rated life insurance company, a structured settlement provides long-term benefits which flow to the individual on an income tax-free or tax-deferred basis. Because of Dan’s own hip replacement in 2010, he has even greater compassion for those who are going through this traumatic experience, and he is equipped and ready to personally walk you through your settlement process. In order to take advantage of tax benefits, the settlement must be ‘structured’ BEFORE the settlement is concluded. Depending on the settlement terms, your proceeds may be “income tax-free” (due to physical injury), taxable, or a combination of the two (depending on the exact circumstances). Regardless, a structured settlement is valuable and should be considered. It’s your choice and your right. Because a structured settlement is detailed process that must be handled by a properly licensed firm such as ours, it is critical to let your attorney (if represented) know that you are considering this option. We will then need to interface with all parties throughout the process to ensure proper tax code compliance. If you’re involved in a hip settlement because of the DePuy ASR Hip Recall, don’t wait until your settlement has concluded. Now is the time to contact Finn Financial Group to find out how we can help you. 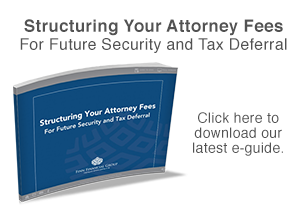 The information on this web site is not intended to provide legal or tax advice. Various tax codes and regulations can be complex and clients are encouraged to seek independent legal and tax counsel.